Yet another new series of three Presentation Sets replaced those previously offered. The set boxes continued to describe the contents as a Railway Gift Set rather than as a Presentation Set as stated in the catalogue. The price lists now referred to them as Presentation Gift Sets. Packaging was in exactly the same format as the 1968 issued sets. 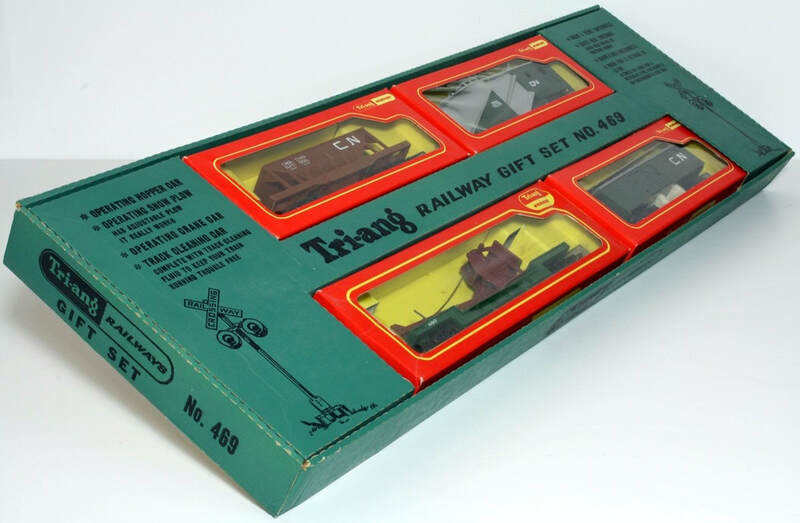 As before, the printing was in black with the packing inserts carrying the ‘Tri-ang' logo followed by 'RAILWAY GIFT SET' and the individual set details both in English and an equivalent translation in French. The issued set was composed of the R.352 CN Budd Rail Car and 2x R.232 CN Budd Rail Car - Non-powered (all in 'silver & black' livery). ​Retail price in 1969 was $21.00 Canadian. The set continued to be featured in the 1970 Catalogue when the retail price was reduced to $20.00 Canadian; but still a full $7.00 less than the total price for the three individual items. The issued set was composed of the R.253 Yard Switcher Locomotive (Dock Authority), R.634 60ft Flat Car with two 30ft Containers (Containerway and Pickfords), R.735 60ft Flat Car with two 30ft Canadian Pacific Containers and R.734 60ft Flat Car with three 20ft CTI Containers. Retail price in 1969 was $19.00 Canadian. 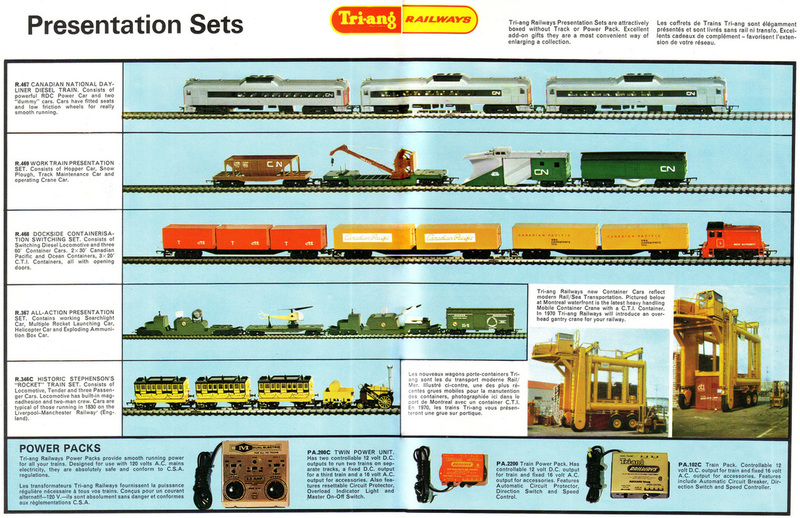 The set only featured in the 1969 Catalogue. Of note is the inclusion of the R.634 60ft Flat Car with the 30ft Containerway and Pickfords containers in this issued set; different from the originally advertised set which included the R.736 60ft Flat Car with two 30ft containers inscribed Canadian Pacific Sea Containers Inc. The set was composed of the R.111 CN Hopper Car, R.138 CN Snow Plough, R.560 Operating Crane Car and R.344 CN Track Maintenance Car. Retail price in 1969 was $10.00 Canadian. The set continued to be featured in the 1970 Catalogue when the retail price was increased to $11.00 Canadian; only $1.20 less than the total price for the four individual items. The earlier R.346 Stephenson's Rocket Presentation Set (with a single coach) was upgraded and repackaged to include all three variations of the Stephenson's Rocket Coaches named 'DESPATCH', TIMES' and 'EXPERIENCE'. 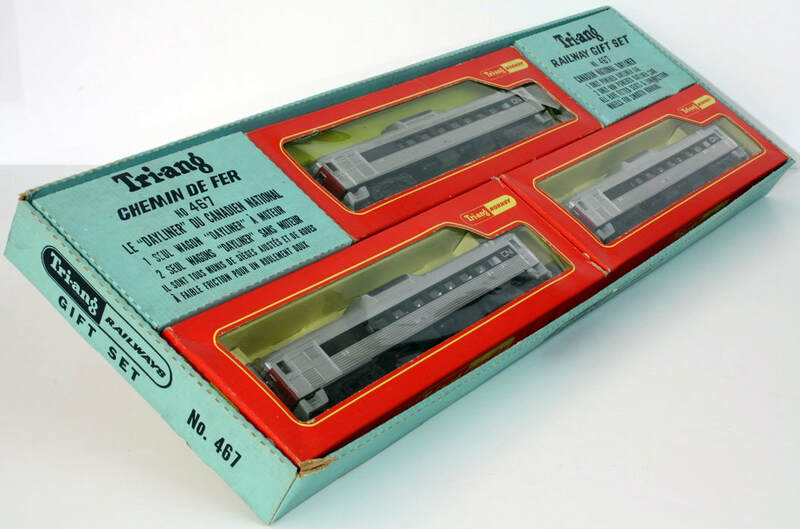 NOTE: As already referred to in the 1967-1968 Canadian Presentation / Railway Gift Sets, and although illustrated in the 1969 Canadian Catalogue, it seems most unlikely that the R.367 ‘All-Action Presentation Set’ was ever made. No new Presentation / Railway Gift Sets were featured in the 1970 Canadian Catalogue and they were discontinued after that date.